BarDyne highly values the importance of training young professionals to use the tools needed to succeed in their chosen profession. HyPneu is the perfect tool for teaching the student how components interact with each other, how systems react to stimuli (external or internal), and how differences in pressure and flow affect the movement of key components. Of course, students can learn these disciplines in a typical hydraulics lab, however, as many universities and technical schools worldwide have discovered, those labs are expensive to build and maintain. With HyPneu Simulation Manager, students can run real time simulations in a safe and convenient virtual laboratory! HyPneu SE (Schematic Editor)—Create customized schematics in a graphical interface using the many tools provided with the software. HyPneu SM includes over 500 of the most commonly used hydraulic, pneumatic, mechanical, electrical, control, and instrument models pre-built for the students’ use HyPneu SM (Simulation Manager)-Your schematic may be integrated with component data to simulate system performance in a virtual environment with HyPneu SM. Simulation results may be seen in real time or for reviewing later in HyPneu Presentation Manager. HyPneu SD (Shape Designer)-You can create custom component icons to be seamlessly combined with preloaded models in their own custom system. With HyPneu Universal Valve Builder, control valves can be customized to model nearly every valve configuration possible. HyPneu PA (Process Animator)-Designers can animate the processes in the hydraulic or pneumatic system including: directional control valve position, cylinder and motor motion, pressure valve actuation, and line pressure. Animation can easily customized to visually communicate what is happening in the system to effectively communicate complex processes to the student. From the drawing board, to schematics, to simulation, to animation, HyPneu designs go full circle! By combining customized icons and animation, students can see what is happening in the hydraulic or pneumatic system. 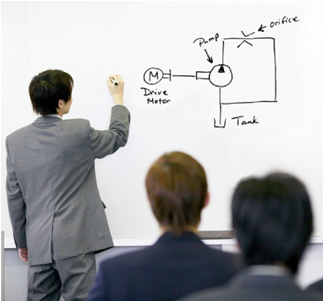 HyPneu for Education comes with a copy of Hydraulic Component Design and Selection. A textbook written by two of the most prominent names in fluid power and motion control, Dr. E.C. Fitch and Dr. I.T. Hong. 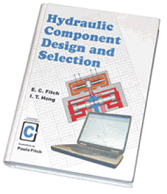 This book offers a thorough instruction of the design and use of hydraulic components. Each chapter also offers practical examples and problems to strengthen the students' ability to apply their knowledge. Bulk rates apply for large orders to educational institutions.